→ New old music - part 12: "Good Times!" New old music - part 12: "Good Times!" No... I am not going to start off this blog post with "Hey, hey - it's The Monkees' 50th anniversary". Even though it is anyway. Fortunately, I'm not quite old enough to remember when they were originally on TV. But I am old enough to have started watching them in the mid-70's. Anyway, you can read all about that whole thing here. So Rhino Records, the owner of the Monkees' properties since 1994, has a bunch of stuff planned this year for their anniversary. The one I was most looking forward to is the Blu-ray release of their TV series (remastered from the original films, and packed with bonus content, including their feature film, outtakes, and various TV appearances). I say "was", because I figured that would likely be the highlight of the year. I had no plans to go to any concerts, or plans to buy any T-shirts or such things, and there were only vague hints of other projects. Maybe a DVD release of their videos/TV specials from their reunions in the 80's and 90's. That sort of thing. Oh, and a new album. Hmmm... well. Wasn't sure what to make of that. When it was first announced several months ago, I figured only Micky Dolenz and Peter Tork would be involved, since they were the only two still actively touring (Davy Jones having passed away in 2012, and Michael Nesmith having gone back to doing other things, as he typically does). Also, at first, I wasn't really keen on the artwork either. It seemed... amateurish. Sloppy. But I'll get back to that. News gradually started trickling out that there was going to be an outside producer and some new songs written by people from bands with names such a "Death Cab For Cutie", "Weezer" (who I'd actually heard of - believe it or not), "XTC", "Fountains of Wayne" and some guys named Noel Gallagher and Paul Weller. Yeah, I know. I thought, "Why is the guy from Robocop writing songs?" too. Nope. That was Peter Weller. Turns out, the producer - Adam Schlesinger - is the guy who wrote the songs for the movie "That Thing You Do" where he pretty-much nailed the vibe of early 60's pop. And he won some Grammys, Emmys, and was nominated for an Oscar, some Tonys and a Golden Globe. Well... can't win 'em all. Anyway, I wasn't sure how this was going to turn out, since it seemed like Rhino was returning to the formula of the first two Monkees' albums, where studio musicians would lay down all the tracks, and the two remaining Monkees would just go in and throw some vocals over 'em. Boom. Done. It looked like they might have minimal involvement, at best. And I wasn't sure about "music" written by a bunch of Gen-X slackers, either. (No, I'm not an ageist. Okay... yes I am. Punks. Some of 'em are barely in their 40's!) 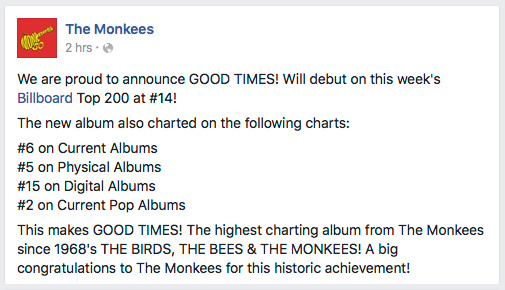 How would it stack up to the massive catalog of Monkees' work? By the way, when I mean massive, I mean massive. They were part of a music making machine that featured the likes of Neil Diamond, Harry Nilsson, Tommy Boyce and Bobby Hart, Carole King and Gerry Goffin, Jeff Barry, and countless others, and they had their pick of songs to record (in addition to those that they wrote themselves). Besides their original run of nine albums (roughly 105 tracks, depending on how you count), there was enough leftover material for three "Missing Links" albums of rarities (almost 60 previously unreleased tracks), plus more additional bonus tracks and alternate takes on various CD reissues than I can count. It numbers in the hundreds. The amount of music they cranked out in around five years is impressive. More impressive, is how good most of it is. In '96 the four of them got together and did an album entirely themselves - no outside producers, writers or musicians - called "Justus". The idea was to return to the era of their third album "Headquarters", where they played more as a band, rather than as a product of Screen Gems (although they still used outside writers and a producer to help with it). The problem with "Justus" though, was it really needed an outside producer to guide it. While Nesmith (who did the majority of work producing it) had done over a dozen excellent solo albums, the Monkees seemed to be struggling with trying to be relevant in a musical world they weren't familiar with or comfortable in. The reviews weren't kind (one referred to is as "old man grunge" - which, sad to say, is pretty accurate), and sales were even less kind. Monkees fans, while thrilled that all four of them had reunited, weren't all that enamored with the results either. After the opening U.K. leg of a reunion tour and a mediocre TV special, Nesmith backed out of the group again, stung by the critical response to the album and tour. So in 2016, twenty years after that, and four years after Jones had passed away - what was left? I wondered what kind of a fresh mess awaited the Monkee-faithful? As the release got closer though... some more news was leaked out. Besides the new songs, Rhino had found some unfinished tracks from the 60's by those same original songwriters mentioned above. They'd be recording new vocals for them, and one would feature a vocal originally recorded by Jones as a tribute to him. Okay... so we'd have some old and some new. I wondered how those would all mix together. But then, Nesmith got involved. Not just singing, but playing guitar, and writing a new song as well. And not just singing background, but lead on several songs. And Tork wrote a new song. And Dolenz wrote a new song. And they were all playing - to some degree - on most of the tracks as well. 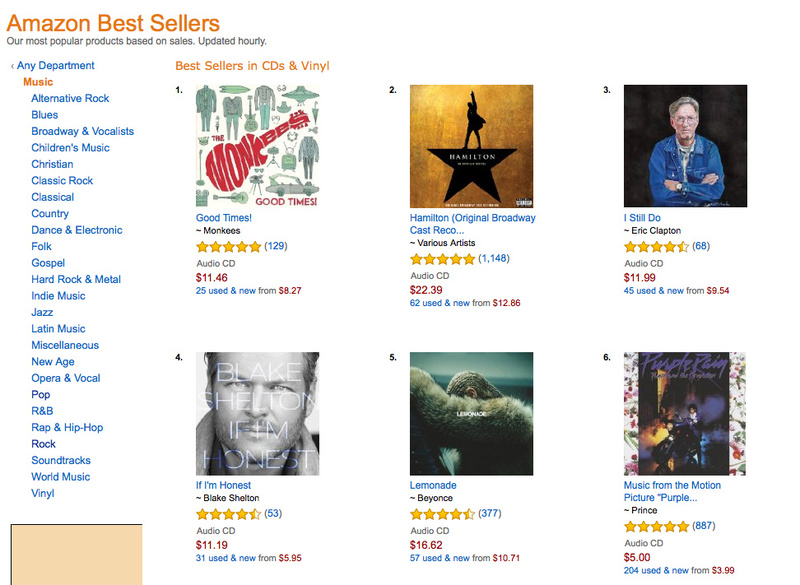 So... not a return to the first two albums - "The Monkees" and "More of The Monkees". Not "Pool It!" either. Not "Headquarters" or "Justus". But rather - their fourth album - "Pisces, Aquarius, Capricorn & Jones, Ltd.". Widely regarded as their best album - because it was a mix of them as a band with professional session musicians, and an outside producer working with them. The best of both worlds. Now, things were sounding promising. But, how would the album sound? Well, Rhino pre-released two of the new songs - "She Makes Me Laugh" and "You Bring The Summer". I gave them a quick listen (despite my no-spoiler policy) and thought they sounded pretty good. They had a definite 60's pop vibe to them, without sounding too dated. But would the whole album be like that? One of the things I like about The Monkees' catalog is the sheer diversity of music. Remember - this is a time when the entire music industry was being up-ended by the likes of The Beatles, Dylan, The Stones, The Who, The Beach Boys (more to the point - Brian Wilson), the British invasion, Monterey Pop, Jimi Hendrix (and yes... he actually did open for The Monkees on tour), and everything that went into and was influenced by the culture of the mid-60's. The Monkees', and the songwriters they were drawing material from, were just as influenced by what was going on as everyone else in the music world. So while bubblegum pop had been the order of the day when the TV show started, their later albums were far more diverse - dipping into psychedelia, country, folk, acid rock, and exploring whatever genre happened to be of interest at any given time. So I was hoping that, while these were certainly nice enough pop songs, the entire album wouldn't be so narrowly focused. Then they released the third song - "Me and Magdalena". It wasn't a pop ditty. It was an introspective, simple, melancholy track beautifully sung by Nesmith and Dolenz. It reminded me of some of the deep album cuts from the Monkees' later albums. A song they made because it was good and interesting. Not because it was commercial pop. It looked like they were on the right track with the album, finding the right balance. Someone, it seemed, understood The Monkees. Suddenly, I was looking forward to the album. So much so, that even though I pre-ordered the CD and it was due to arrive last Friday, I bought it on iTunes when it was released, because the mailroom at work was going to be closed Friday through Monday (Memorial Day weekend), meaning I would have to wait until Tuesday to listen to it. That just wouldn't do. So now, I own two copies. I'll get back to owning multiple copies of the album in a minute. The variety is there, too. Somehow, amazingly, Schlesinger was able to pull all of these different songs together, from different times, different sources, different writers, and make a cohesive whole from them. Sure - the happy TV-pop music is certainly there. But there are quiet songs, rockers, psychedelia, Beatles-esque influences, and to be honest - at times I have to look at the track listings at times to figure out which songs were written in the 60's, and which are modern. Maybe what makes The Monkees what they are, is that they don't have "a" sound. They have several. Their voices are the constant, while the music changes around them. But it all fits together. This is the reunion album Monkees' fans have been waiting for. It's The Monkees brought into the present. Modern, but not trying to be something they're not. Classic, but not dated. It's... just right. Funny thing about that. People are apparently noticing. Even more surprising, is that they're getting good reviews to go along with the sales. Besides holding an 89% five-star rating on Amazon, and a 95% five-star rating on iTunes, they're even getting good press from the likes of The New York Times and Rolling Stone. Did hell freeze over, and I missed it? I'm pretty sure that would've been on the news. Even Nez is flabbergasted. No longer a punching bag for hipper-than-thou music critics, liking The Monkees is somehow acceptable now. I guess given enough time, even nostalgia becomes respectable. But in this case - it's nostalgia done right. Which takes me back to the artwork. While listening to the album, and seeing similar promotional artwork for it - I get it now. It's not supposed to be perfect, or tidy. It's a memory. A sketch out of time. And it fits the music perfectly. In the end - the real testament of the album is that I keep listening to it. I have yet to tire of it. It's great pop music, but it has depth. It's fun, but it has maturity. It doesn't feel like guys in their 70's trying to be guys in their 20's. It's three guys having, quite appropriately, Good Times! It has everything it should. The only thing truly missing from it, sadly, is that Davy Jones didn't live to be part of it. But he's still there. Never forgotten, and the album is dedicated to his memory. The only lingering question now is... will they do another? Part of me hopes yes, because this was so good. So welcomed. On the other hand - it would be a great one to go out on. Nothing wrong with ending on a high note. Good Times! gets a 9/10. Now then... the only reason it doesn't get a 10/10, is because of something that I hate about the music industry: exclusive bonus tracks. You see, the CD I ordered from Amazon has 13 tracks. The iTunes Deluxe version has two bonus tracks. F.Y.E. has an exclusive CD with a different bonus track. There's also a fourth bonus track that you can only get on vinyl from Barnes & Noble or on a Japanese import CD. I've already bought two versions... to get the rest of the music, I have to buy two more. I hate the music industry. But thanks for the album! Well, I managed to pick up the other limited editions of the album, wrangling the four bonus tracks together. The two on iTunes/Amazon - Terrifying and Me & Magdalena (version 2) - are both quite good. Terrifying was good enough to be on the album as is. Version 2 adds a more upbeat and fuller backing track to the album version of Me & Magdalena. It gives the track a completely different feel, but I prefer the quieter album version. The third track (available from F.Y.E.) - A Better World - was penned by Peter Tork's brother, Nick. It's a decent track, but musically it doesn't fit in with the rest of the album, and it's easy to see why it was left off. 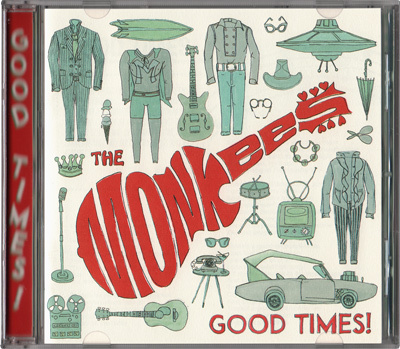 Produced not by Adam Schlesinger, but by Andrew Sandoval, who although he has been producing The Monkees' reissues (and those of many other artists) for years, doesn't capture the feel of the rest of the album with this song (in no small part because the backing vocalists are mostly from outside the group - making this sound less like The Monkees, and more like a solo track). Also, thematically it's a bit ham-fisted. If you're going to tell the world we can solve all of its problems - find a lyrically more interesting way to do so. The Blu-ray set should be out in a week. Looking forward to it!